The subscription streaming network known as Acorn TV makes for a solid investment if you’re a glutton for British programming. You could watch it all day and into the night for a long, long time without ever catching up with its vast menu. Acorn’s latest acquisition, The Level, a whodunit featuring the first post-Downton Abbey series role by Robert James-Collier, ends up being only a fair to middling investment. All six hour-long episodes have been made available for review. It never quite loses its grip, but you could easily free yourself from it. This is particularly the case when episodes are available at the rate of just one per week on Acorn as opposed to all at once on rival streamers Netflix and Amazon. Critics had the opportunity to watch all of The Level’s opening season in hopes of being rewarded with an increasingly compelling yarn capped by a consummate payoff. Well, not quite, although The Level does prove to be reasonably involving. 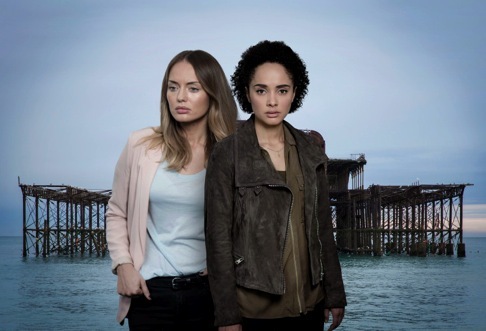 The principal star is Karla Crome, known to some U.S. viewers as Season 2 series regular Rebecca Pine in CBS’ Under the Dome. This time out she’s detective sergeant Nancy Devlin, whose compromising position with a mobster named Frank Le Saux (a very briefly seen Philip Glenister) ends up compromising her when she witnesses his shooting death early in Episode One. Devlin also suffers a festering bullet wound, which she strives to cover up both literally and figuratively. This gets more complicated for her when she’s also assigned to the team investigating Frank’s murder. The exact nature of Frank’s “gold mine” is also a mystery. What is it and who wanted it badly enough to kill him? The Level ends up providing these answers in its climactic episode while also leaving an open-ended door to a Season 2. But as of now, there’s been no commitment. The aforementioned James-Collier, who came to fame as conniving butler Thomas Barrow throughout the entire run of Downton Abbey, reemerges as detective sergeant Kevin O’Dowd. He very much fancies Nancy and she’s likewise fond of him. But a gulf emerges during the investigation, with detective sergeant Sean “Gunner” Martin (Noel Clarke) hoping to someday bridge it. Also on hand is stern boss cop Michelle Newman (Lindsey Coulson), who’s mostly impatient, occasionally compassionate and a bit tiresome in time. Meanwhile, Nancy strives to re-connect with Frank’s daughter, Hayley (Laura Haddock), who used to be her best friend before they became estranged. Hayley’s mentally challenged brother, Tate (Clan Binchy), is also in this mix, as is her brutish ex-husband Shay Nash (Joe Absolom), a bottomless fount of bitterness. Frank’s widow, Cherie (Amanda Burton), adds some spice and intrigue, as does Nancy’s seemingly no good father, Gil (Gary Lewis), whom she’s grown to detest. It could have been a richer broth, but The Level is pockmarked with inconsistencies, some of them merely irksome. It’s amazing, for instance, what a little peroxide can do for Nancy’s very badly infected bullet wound. And in Episode 3, a confrontation between detective sergeants Martin and O’Dowd leaves the latter with a noticeably cut lip. The punch occurred out of every one else’s eyesight, but no one in the department takes any notice at all when O’Dowd shows up looking visibly worse for wear. Sometimes it’s the little things that vex, including the constant waylaying of conversations by cell phone calls. “I have to take this” almost becomes a mantra. The Level in the end falls short of first-rate while also rising well above a lot of the other stuff out there. Capable performances are plentiful, but none rise to the level of standout. Still, Acorn TV is well worth your acquaintance as a motherlode of British fare, much of it exclusive. You can test drive it for a free week if you’d like. Fair warning, though: The current menu offers an alphabetic array of 256 movies, series and miniseries. Including The Level.